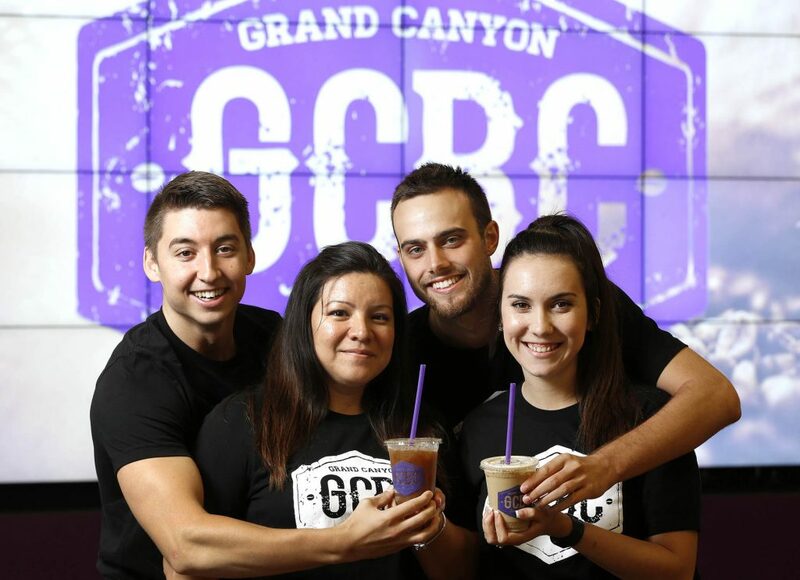 From left, Parker Shipe, Julisa Smith, Brennan Williams and Lauren Lentini are recent GCU graduates hired to manage GCBC, a for-student, by-student business. Something new is brewing at Grand Canyon University, and it’s not just coffee. 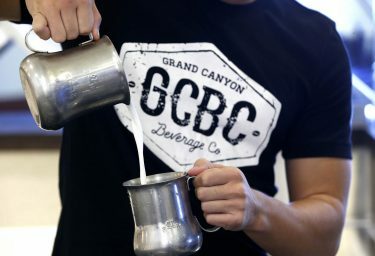 This year, folks hankering for a cup o’ joe on campus have a new option for satisfying their yen: Grand Canyon Beverage Company (GCBC), a University-owned business managed by graduates and run by students. “It’s by the students and for the students,” said GCBC General Manager Brennan Williams, a recent graduate and former leader of the wildly popular Havocs. GCBC, which also sells energy drinks, gourmet donuts, tea and other goodies, is one of three new student-operated businesses the University is launching in the coming months. It will be followed by a T-shirt and merchandise company this fall and a clothing and supply exchange next year. The intent is to create viable business enterprises in west Phoenix that have a significant client already in place — the University itself — and the ability to provide those goods and services externally as well. GCBC is more than just coffee — it’s other beverages and tasty treats, too. Bacon donuts are part of the funky menu. GCBC opened its doors in August and has two locations: the second floor of the Student Union and the ground floor of the newly constructed Roadrunner apartments. When it comes to coffee, GCU has a fragrant history. The first coffee shop, in 2002, was Latte Dah. Next came Jazzman’s, then Starbucks, Peet’s and Canyon Coffee. As befits the University’s philosophy to explore assets worthy of investment, a GCU-owned beverage company was born. To manage it, GCU hired Williams and fellow 2016 graduates Julisa Smith, Lauren Lentini and Parker Shipe as shop managers. With access to GCU’s full portfolio of resources, they chose a name, picked a logo, developed a menu, created a mission statement and selected interior designers to redo the entire Student Union second-floor space, which will be theirs to manage. They sought to create an attractive yet homey place where students, faculty and staff come to purchase beverages and snacks but stay to socialize with friends or study. The Roadrunner location is expected to have a bolder, more outgoing atmosphere. Sure, GCBC offers drips, flavored lattes and other traditional caffeinated favorites as well as energy drinks, teas and other beverages. 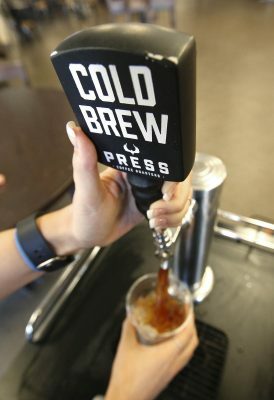 But new to the campus scene is cold-brew coffee that pours from a tap and is so smooth, in Shipe’s view, that delicate flavors become detectable. “You can really taste the chocolations,” he said. Cold brew coffee, anyone? It’s smooth and fun and students are snapping it up. Also new is nitro coffee, so named because it is made from infusing cold brew coffee with nitrogen gas, which gives it a foamy head. “It comes out like a creamy river,” Smith said. The managers also are focused on shortening wait times and, to that end, planned to hire as many as 50 student workers. “With the right management, this place could be a cash herd, not a cash cow,” said Judith Baldwin-StHilaire, a hospitality major who was visiting the business. The managers chose local vendors, including Press Coffee Roasters, White Lion Tea Company and Fractured Prune Doughnuts. Anyone who has spent even a few hours on GCU’s campus probably has gotten a free T-shirt. The University provides them by the thousands, and for years, GCU’s tremendous taste for T-shirts has profited outside coffers. But now GCU hopes to funnel those dollars back to the University with its own business that will make and sell T-shirts and other apparel and merchandise. “Canyon Promotions,” a retail and manufacturing company, is expected to operate in a 7,000-square-foot space in the new parking garage on Camelback Road. While GCBC and Canyon Promotions market new products, the third business, “Canyon Exchange,” will capitalize on debris students discard, Mueller said. After ground students departed last spring, Mueller was stunned by the sheer volume of belongings — desks, stereos, furniture, clothing and other items — left in dormitories and student apartments. Instead of getting rid of the items, GCU officials came up with the idea for the Canyon Exchange, which will operate similarly to the popular Buffalo Exchange companies. Customers will get store credit for unwanted items they bring to the store and can use the credit toward items they purchase. It benefits not only students, but residents in the area looking for affordable second-hand options. GCU is exploring possible locations along Camelback Road for the Canyon Exchange store front. The benefits of new business are manifold, Mueller said: They allow recent graduates to remain here and work, they help GCU meet its determination to keep tuition low and they create an employment opportunity for people from the neighborhood. “I don’t think there’s a more God-honoring thing we can do than create a product or service that makes people’s lives better and creates jobs,” he said. GCBC’s aromatic beverages and tasty treats also figure to be available to the public — an off-campus location is already being discussed — because expanding the franchise is an idea that is, well, percolating.